Type: Mixed use:Mixed Use, Residential + Community Centre. Services: Lead consultant, Consultation Lead & Planning Agent. Density: 136 dph / 443 hrh. 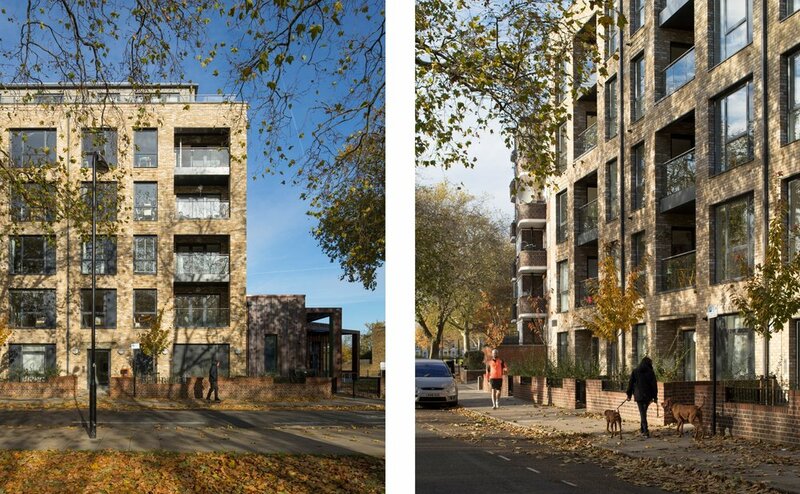 This project provides 19 homes and a community centre in Hackney. The project makes use of under utilised land as part of a tight urban infill scheme on Gascoyne Road. A new light-filled and copper clad community centre has been created for the neighbourhood following a series of engagements with local residents. These included a documentary film of the construction made by the youth club with the help of film maker Derek Smith. Above the community centre, within a building in part manufactured off site, generous mixed tenure apartments overlook Well Street Common. Large family homes, which are also part of the project, link through to the adjacent terraces, stitching the post-war Gascoyne estate together with the neighbouring streets.